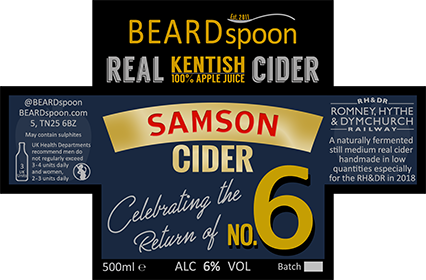 BEARDspoon Cider is all about the taste and purity - with over 8 years of experience crafting the most tantalisingly tasting tongue twisting Cider, using nothing but the highest quality Kent apples, we have perfected a unique and refreshing flavour sought after across the country. Our endeavours have been recognised by Cider drinkers nationally by awarding us on an almost yearly basis since we began our adventure. It is an honour to recieve these awards (detailed further on the About page) but the true test comes with your first sip. Interested? See what we've been working on below. All our ciders are available in 10l and 20l Bag in Boxes or in cases of 12 x 500ml bottles - please be aware we are currently wholesale only. 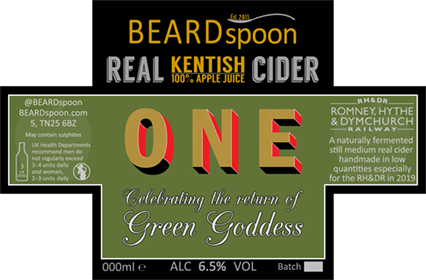 Our first and award winning Real Kentish Cider, crafted from 100% Bramley Apples. Bramleys are a classic sharp cooking apple which loses little of its character when used for Cider, creating a refreshingly sharp and clean looking drink for the Summer months. Our Bramleys are like no others you've tasted before, they truly have a unique flavour all on their own allowing us to make a one-of-a-kind 100% Bramley Kentish Cider! A medium single variety packed with a sharp refreshing tang and unique full bodied sweet-shop Apple flavour. Our first blend of classic English apples has created our strongest and most robust cider. At it's maiden event it achieved 3rd place in the Kent Region of the CAMRA Cider Competition at the Planet Thanet Easter Beer Festival! A naturally strong Medium-Dry blend with an initial sharpness followed by a good body and a hint of sweetness. A special blend in recognition of Ashford's long-gone Cider maker Ashford Valley Cyders ltd. Produced in 'The Cyder Factory' on a site adjacent to Ashford's Domestic Railway station between 1948 & 1964, their most successful blend was the Prizewinning 'KC Cyder' which ours hopes to echo. 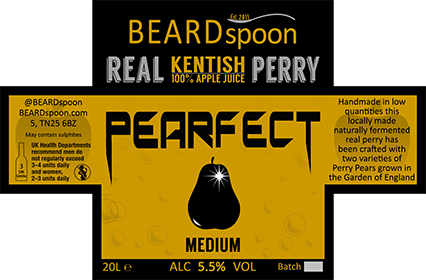 A smoother and slightly thinner Dry blend of strong apple flavours with a hint of the classic Kentish sharpness. This blend was new to 2018, it brings together the traditional West Country Cider Apples and Eastern County Style's eaters and cookers into one superb full body cider. A medium dry blend of classic soft tannin rich flavours and sharp tangy crisp apples notes. A blend of two ancient varieties which should be Pearfect!. This special blend of Grenadier and Howgate wonder is exclusive to our friends at the Romney Marsh Brewery and their Ales by the Rails shack at Dungeness Station. Named in sequence with the two looming Nuclear power stations Dungeness 'A' & 'B'! A refreshingly light and clean cider with mellow flavours but with punchy apply bite! 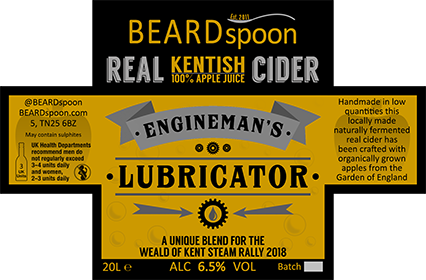 A unique cider blended up specifically for the Weald of Kent Steam Rally in 2018 and 2019. A classic Eastern counties cider with a bit of everything blended in, including some proper Cider Apples for a great balance of flavours. A rich complex cider with heady light apple flavours and a stronger tannic body. 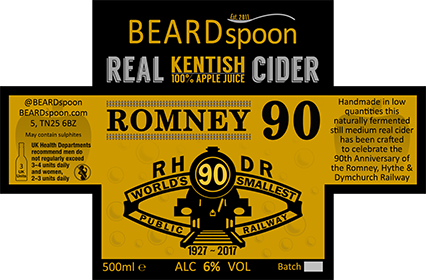 2017 was the Romney, Hythe and Dymchurch Railway's 90th Anniversary, to celebrate this we blended up a suitably special cider! It was available in all the railways shops & cafes, at their Fathers Day Beer & Cider Festival as well as on board 'Gladys' the licensed Bar Car which is available to hire! Another celebratory cider produced in 2018 to commemorate the return of locomotive No. 6 'Samson' after major overhaul on the Romney, Hythe & Dymchurch Railway. 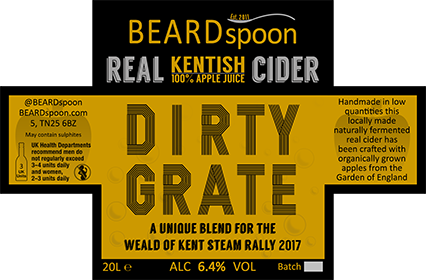 This Strong Medium/Dry Real Cider was our one-off 2017 blend for the Weald of Kent Steam Rally. 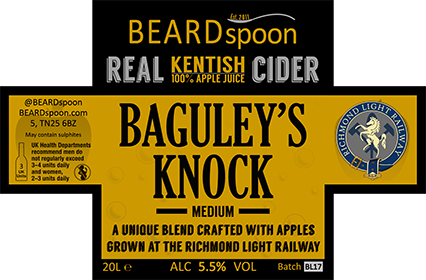 Produced every year 'Baguley's Knock' is named after a diesel locomotive on the Richmond Light Railway where this blends of Apples are grown. Less then 50l are produced each year for the railways open day in August.